Remove stem from each mushroom. Grease an 8x10-inch baking dish with non-stick cooking spray. Place mushroom caps upside down in baking dish. In a large skillet over medium-high heat, cook sausage until no longer pink (approx. 7 minutes), break sausage into small pieces as it cooks. Reduce heat to medium and stir in cream cheese until melted (approx. 2 minutes). Add panko breadcrumbs and remove skillet from heat. Stir skillet until all ingredients are combined. Add 1 tablespoon of parmesan cheese and salt, stir well. Allow to cool. Fill each mushroom cap with an equal amount of sausage stuffing, mounding it high over the mushroom. Bake for 25 minutes, until filling is bubbly and mushrooms are tender. 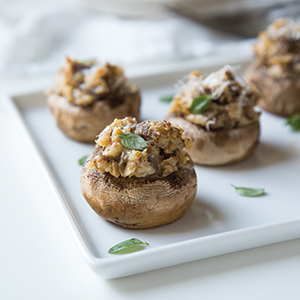 Sprinkle remaining 1 tablespoon of parmesan over mushrooms as they are removed from the oven. Garnish with basil before serving.